The accommodation comprises fully furnished apartments which are suitable for either short visits or longer stays for those working in the area. 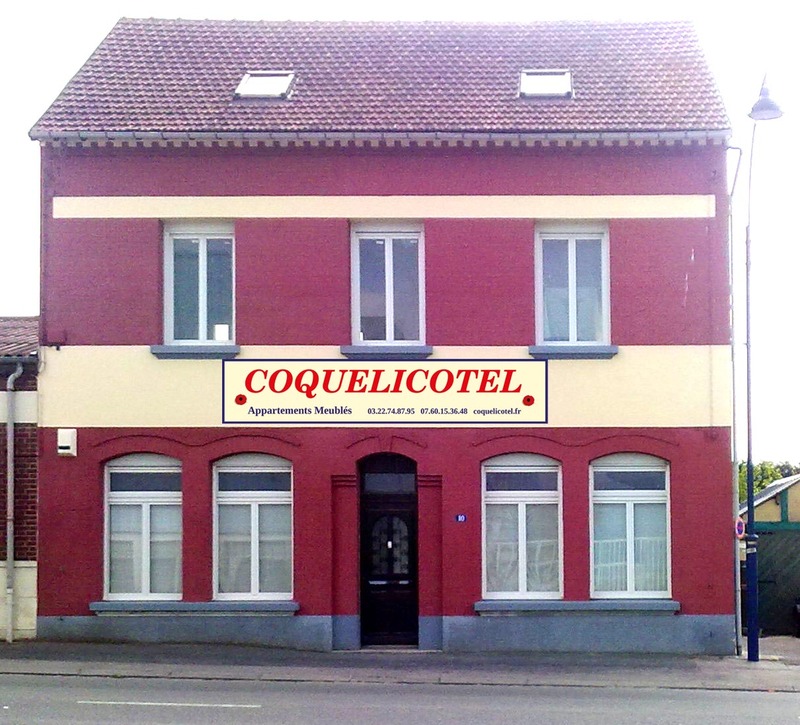 We are situated right beside the WW1 touristic “Circuit de souvenir” and we are ideally situated for people working at the ZAC de Coquelicot, the Aéroport Albert Picardie and Aérolia/Stelia. Unlike hotel accommodation or chambres d'hôtes you can prepare and cook your own meals. Each apartment has a large fully fitted and equipped kitchen with induction hob, halogen oven, microwave, fridge, all utensils, pans, crockery and cutlery and of course tea & coffee making facilities. Our tariffs are all inclusive. Electricity, heating, water, local taxes are all included in the rental price; our tariffs are degressive, the longer you stay the less you pay. Unlike others our prices remain the same throughout the year, we do not raise them during holiday periods, the WW1 commemoration dates or during the winter months when the heating is used. We have our own off road car park and on site secure covered parking is available for motor cycles on request. The Zone commercial de Bellevue containing the family restaurant Flunch, supermarkets and local shops is approximately 500m from Coquelicotel. The centre of Albert is a 15 minute walk from Coquelicotel. The TGV station Gare TGV Haute Picardie and the autoroute A26 are a 20 minute drive from Coquelicotel. Phase one of Coquelicotel is completed consisting of two spacious studio apartments of 30m2 and 25m2 on the second floor, a converted grenier with exposed beams and lots of character. They are suitable for couples or families with one young child and/or a baby (cot available on request) or for single occupancy. Apartment 6 has an additional bunk bed suitable for a younger child. The apartments are warm and cosy and have electric underfloor heating. The en-suite bathrooms have bath and shower facilities. Clean bedding and towels etc are supplied and each apartment has a second spare set. Each apartment has a desk/study area and 12mb wifi access is available throughout the building. The apartments are very well insulated and sound-proofed, we are situated on the RD329 within a newly created and landscaped 30km/h pedestrian priority zone, it is very calm with little traffic, far less than the main roads and by-pass where the other hotels are situated. For the comfort and benefit of all our guests Coquelicotel is a no smoking building and we politely request that this be respected, we have a full fire alarm system as well as physical fire protection, emergency lighting etc well beyond the requirements of the regulations. Smoking in any part of the building including the stairwell and reception area will trigger the alarm causing an evacuation of the building. Key words: Somme battlefields, self catering accommodation, gite, chambre d'hote, B&B, Albert; Meaulte,Hotel , WW1 battlefields, Tour de France 2015, Courses du Coquelicot. Festival International du Film Animalier.